Getting traffic to newly created websites is considered as a difficult task to perform. Web owners try and give their full efforts to bring some decent traffic to their websites. For this purpose, they do SEO, SEM, Social media optimization, Social sharing and many other efforts. But at last, they say, I have tried a lot but I did not succeed in getting traffic to my website. Last month I got 19,250 visitors from Twitter for one of my niche (entertainment) blog. 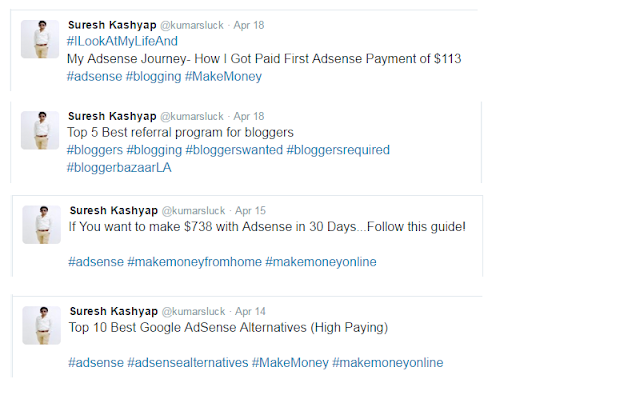 I did not do any special task, I also followed these simple steps that I have shared in this post and I got results. You will find each and every step (almost with screenshots) in this guide. 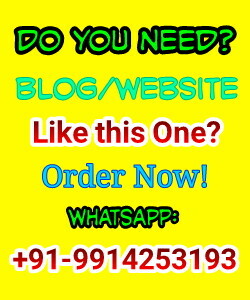 I am sure if you follow this guide then you will definitely get a good number of visitors to your website. Most of people or Web owners fail because they do not have exact and proper knowledge of How to do content marketing to bring targeted traffic to their websites. It is also true that bringing traffic on the newly created websites is not a cup of tea. It needs some time, patience of the blog owners, proper strategies, proper promotions, ideas of content writing, knowledge of SEO and so many other facts that are responsible for bringing traffic to blogs or Websites. When bloggers search keywords in Google or other search engines like, "How to get more traffic to website" they are shown some results and suggested that if they want to bring traffic to their websites then they will have to do SEO, they will have to submit their sites to social bookmarking sites, submission in web directories, sharing on social networking sites like, Facebook, Twitter, Linkedin, Pinterest and other popular social networking sites. No doubt, for newbies SEO and Social networking sites are a good source of traffic to their websites. But, whenever we talk about Social promotions people or especially newbies are ended up with a single name, i.e., Facebook. They start creating multiple accounts and pages on Facebook and start sharing their contents on that pages and expect now their websites start getting huge traffic from the social sharing. To be honest, they do not get any traffic to their websites excepting some clicks. If you are agreeing then you might proceed but if have not agreed with the words I stated above you might navigate to the other posts of this blog. As In this post, I am going to share some tips that will definitely help users to bring some targeted social traffic from Twitter. I will not discuss any other social sites like Facebook or Linkedin. My main focus will be on Traffic from Twitter. So, I was talking about what newbies do at their very first stages after creating the website to bring traffic. They only target to bring traffic to their websites using Facebook. I would like to clear them if they focus on Twitter to bring traffic to their sites they might get some better results as compared to Facebook. 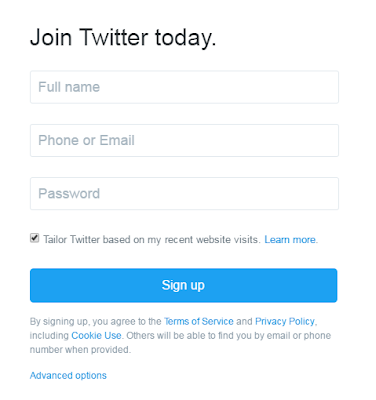 I am not asking here to just sign up on Twitter and start tweeting your posts. If you are thinking like so then you are wrong. I am going to discuss some tips and tricks while using twitter that will definitely help you in bringing targeted traffic to your websites. I will also share some tips for getting traffic from Facebook to your posts in future as my priority in this post is on how to bring traffic from Twitter to our websites. So keep reading. I know you are going to love this post. Can we really bring traffic from Twitter to our websites? As of the fourth quarter of 2015, the microblogging service averaged at 305 million monthly active users. At the beginning of 2015, Twitter had surpassed 302 Monthly Active Users per quarter. Above given data might have made you clear about the possibilities of getting traffic from Twitter to your websites. I am sure, If you use Twitter well, it can drive tons of traffic back to your website. But simply tweeting the title of your blog post with a link back to your site will not work. You need to be pro-active and be creative. You need to use great marketing when you are tweeting about your blog posts. And today, I am here to guide you how you can do those things. Here I am going to take an Example of an SEO user while teaching the steps. You can replace the SEO word with your own Website category or job. 2. Click on Sign Up button and fill the registration form. 3. You might be asked to verify your mobile number and Email address. 4. Now you can Login your Twitter profile, update your profile picture and cover photo. Must follow Tips to keep in mind while creating a Twitter profile. You can use your real name as a display name, but do not forget to add the word SEO in your username. I hope you have gotten my words. On the Twitter, usernames play an important role in suggesting the people you should follow in your Industry. 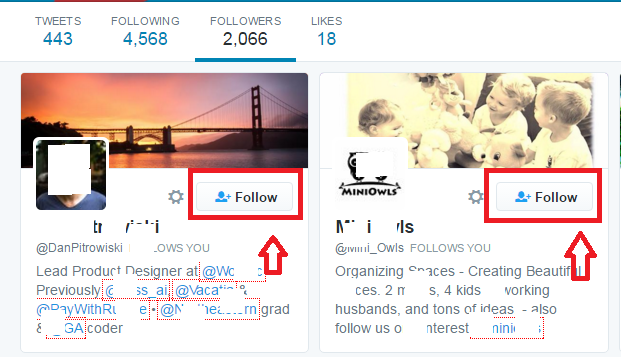 If there is a word SEO in your username, Twitter will show you the profiles who also deal in the same industry of SEO. That is why I suggested you to add your main keyword of job profile or website category in the username of your twitter profile. After creating a new profile on Twitter, our next step will be on gaining real followers. I am not going to suggest you buy Twitter followers as there are lots of websites that provide this service of twitter followers. If you do, you’ll only get the numbers and a big hole in your pocket. Do not worry, now I am going to share some secret (some of you might be aware of) tips of Gaining more and real Twitter followers in short span of time. As these Twitter followers are going to increase traffic to your websites. It might be liked by newbies too. 1. Get to any of your competitor’s profile. 2. Check on his followers button. 3. And follow 50-100 of his followers. Follow this step daily. You will see that your followers have started increasing. It is a fact on Twitter if you follow someone that person might follow you back with a surety of 70%. Did not get my words? If you follow 100 people on Twitter then from that of 100 people you might be get followed by 70. I can prove this by giving you a little task to do. What you have to is, login to your Twitter account, find out any Twitter profile having lots of followers (1000's) and given attention to the Following tab too on that people's profile. You will see, the profile owner is also following the people in 1000's. 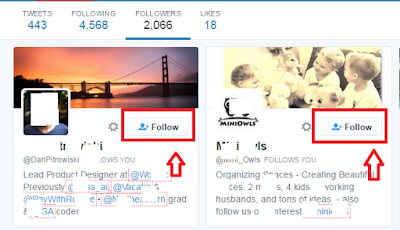 If you check in deep you will find that most of the profiles are same in both the tabs (Followers & Following). Here is the screenshot of the same type of profile I am talking about. It does not mean 100% of Twitter followers doing like same. This technique is used by those people who deal in businesses, want to increase their followers, want to generate leads and sales using their twitter profiles. No doubt, renowned and celebrities get thousands and millions of followers automatically but when it comes to the normal users then it becomes very hard to have some twitter followers then the only way we have is to follow this technique of getting know your presence to the existing people on Twitter of your industry by following them and as a result you might be followed by them. If you're a celebrity or with a good subscribers base then you may leave this step. Till now, some of we guys are just using Twitter to getting backlinks to our websites from an authority site, i.e., Twitter, we did not ever expect about getting traffic from Twitter to our websites. Let's continue on the third step. #3 How to Tweet to Get more user engagements? After learning the steps of gaining twitter followers, now we will proceed on the most important step of this post that will decide your success in getting traffic from Twitter to your sites. Simply by witing the name of your blog post with link do not give the traffic that we expect. 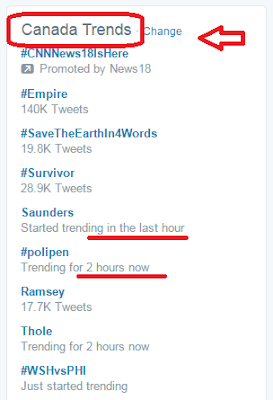 Hashtags on Twitter are considered as very important to use while writing a tweet. For those who still do not know what a hashtag is - basically, it is a word or two behind a # that makes a common discussion subject. Hashtags are a great way to spread your tweets to various topics. What type of Hashtags to use? Include hashtags with the topics about your blog. This gets your tweet seen by other Twitter users searching for the topics you’ve written about. and many other popular hashtags from my Industry. Above given tip helps to target in driving the traffic across the world but now the thing I am going to discuss will help web owners to target traffic from a specific country using twitter. Yes, it is possible to target traffic to your websites from a specific country (USA, UK and canada too). Now I am going to teach you the way that might be called tricks by you guys. I already told that you are going to enjoy this post. So, by not wasting our time, we should proceed on the point. 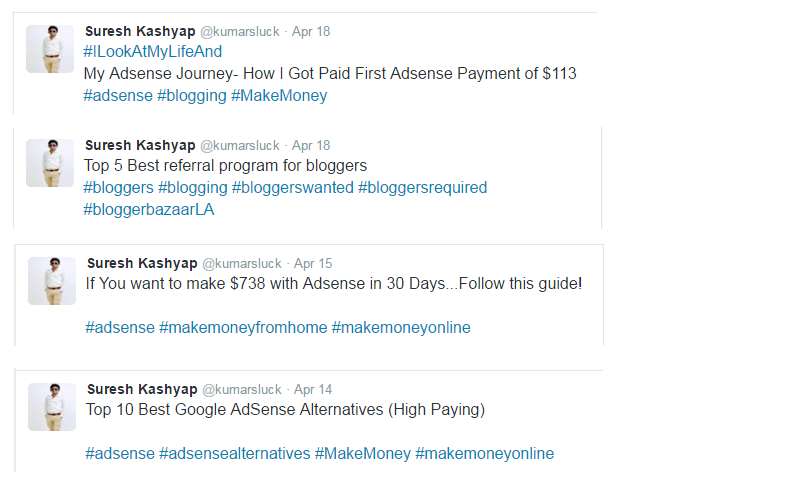 In this example, I am going to target traffic from CANADA as USA and CANADA are always considered as high paying for publishers and blog owners. To be honest, it is quite easy, the only new thing that is to be done in this step is of finding a trending hashtags in that country in last 12-24 hours (Recent hours). Got my point or not? If not follow the steps one by one and you will be known. 2. Move your eyes to the right hand side of your page. 3. There you will find a vertical column of Country Trends and there will be a option to change the country there. Did not get it? No problem, look at below image. 4. In the image, I targeted CANADA as a specific country. But you can change according to your need and targets. 5. Now after knowing the trending hashtags of that specific country our next step is to include that tags in our tweets. It might be some trickiest part and you might need to make some modification while including those tending tags in your tweets. 6. Do not use the trending hashtags in a spam way. If you use the trending tag #myfavoritefood in your blog post, "How to write a quality blog post", it would be considered as spam. 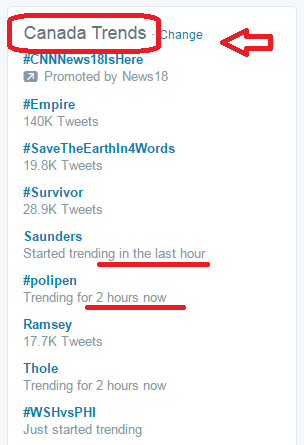 Then how can we use the trending hashtags in our tweets, it never as exact as related with our niches? Simple, use your mind, make little modifications and use the tag. See this example, I am going to use the same tag #myfavoritefood in my technology blog post tweet. here is the url of my post. After writing this long post, i have left only 22 characters to add my link. Now you might be thinking now I can not add my URL in that tweet as twitter allows only the character limit of 140 Words but URL's are generally longer than 22 words. Do not worry, I have a solution for this. Are you feeling tired or laziness? 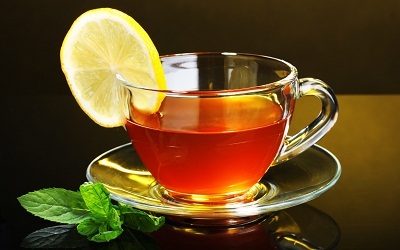 Let's have a cup of tea or coffee whatever you like to refresh your mind. 3. Use Goo.gl Url shortener by Google to make your URLs short. Yes, you should always use Goo.gl service to make your URLs short while adding them in your tweets. It helps in tracking the clicks and also provides more space while writing our tweets. Goo.gl service will provide you detailed statisctics on where you have gotten the clicks, number of total clicks with a graph. and I will be mentioned in your tweet. Give your followers a taste of your blog post. It might increase the number of clicks. Include an intriguing quote from your blog post article. Try to find a quote that’s concise and gives a flavor of the contents of your post. You might have noticed in above examples of my tweets I have used the same in tweets. #6 Use Attractive images in your tweets to get more clicks. The more appealing and enticing your tweets are, the more they will be interacted with, and the more they will drive traffic back to your site. Always try to find an image that will attract your followers, and make them want to find out more by clicking through to your post. You can also include Call-to-action in your tweets or images. You can write the words, "Click on this image to know more". It is seen that 55% followers act for sure on the questions asked by the people whom they are following. So it would be a great idea to ask some questions, suggestions and improvements from your followers. 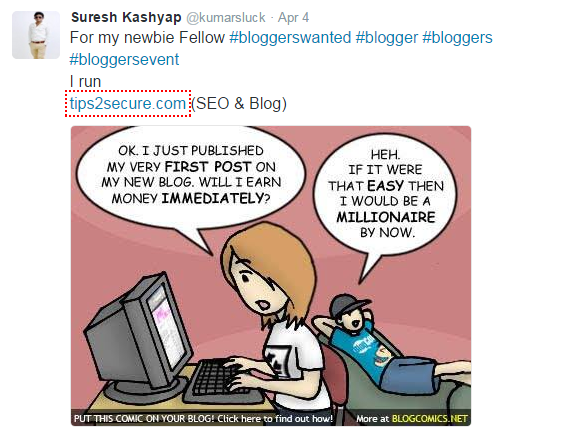 If possible you may include the URL of your blog post in the tweets while asking questions. Now it is the end of the tutorial. 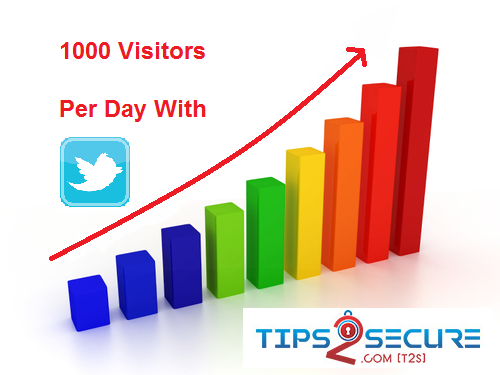 If you follow the above given steps you will start getting a huge amount of Traffic to your websites from Twitter. I am also using these steps to drive traffic on this blog Tips2secure. You can check it on my twitter profile. I have written this post according to my experience and most of the screenshots and images used in this post are taken from my personal profile of Twitter. If you want to follow me on Twitter, you can here is the Url of my Twitter profile. You can also send me a request and add me as friend on Facebook. So, how are you feeling after reading the post? Are you satisfied with my writing or not? Do you have any suggestions? I would heartily like to hear your experiences after reading this post. Must give your comments. Also after reading this post, if you are confused at any point or something that has not been cleared to you then please ask your queries using below comment box. I may provide you a better solution to your queries. If you like this post then I can expect that you might share this post with your friends using the share buttons given below this post. Your single share will mean a lot to me. Message: I hope that you have enjoyed 'Get 1000 Visitors a Day (Traffic) from Twitter to Your Website: 8 Steps Guide' article. However, if you want me to deliver more items, then please share my post. You can use Social Sharing Widget provided at the end of every post. After all, Sharing is Caring! Sure Nikhil, you should give a try and I would like to have your experiences here...! Yes sure you should follw the steps. Also, it would be appreciable if you share your experiences here with our readers. Thanks Richa for sharing your experiences here. Great stuff and amazing post, it is good to learn something new, thanks for sharing. Check also @FanGrowCom http://fangrow.co.uk to gain fans followers better then - Gain more new fans, followers, customers and get valuable rewards such as cash transfer. FanGrow is a Social Media and Internet Tasks exchange platform that will help you to grow your presence in major Social Media networks and in the Internet for free. I personally believe that twitter is more useful than facebook to bring targeted traffic. All the above tips were looking really actionable. I am definitly going to give them a try. Hey suresh, I am not able to find tweet button. How can I share this awesome post to my twitter friends? You are really awesome bro great secrets reveled..